Since 2012, the organization, whose partners include major energy companies, communication companies or divisions of holding companies (e.g., Railways), began to receive official letters from their aforementioned counterparties from the requirement to disclose information about the chain of owners of the firm. In this regard, without going into the current debate about the legality of requirements based on the Instructions of Prime Minister of the Russian Federation №VP-P13-9308 of December 28, 2011, and will describe the order of presentation of such information in the form of a table. Initially, specify the full name of the organization in respect of which it is necessary to disclose information about the chain of owners in it. 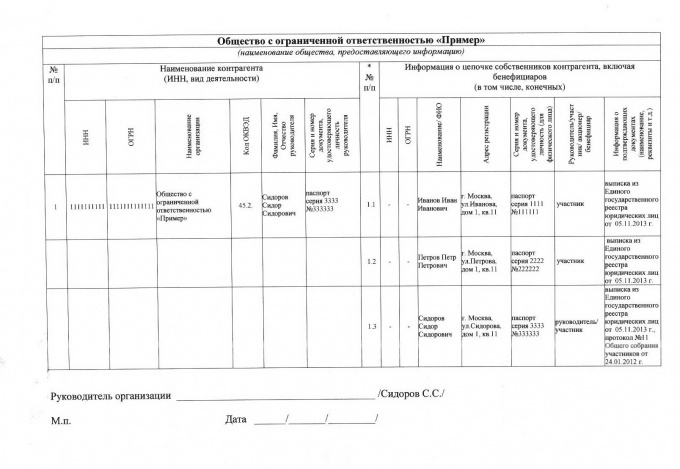 In the left part of the table contribute information about the INN, OGRN, name of the organization, its main economic activity, name of the head, as well as series and number of document certifying his identity. In the right part of the table contribute information about the chain of owners of the counterparty, including beneficiaries (including ultimate). For individuals who are shareholders or members of the organization, the fields: name, registration address, series and number of identity document, the person's legal status (leader, participant, shareholder, beneficiary), information on supporting documents indicating the date and number (certificate of incorporation, minutes of the General meeting, etc.). For legal persons it is necessary to specify an INN, OGRN, the full or abbreviated name, location address, legal status of the person, information on supporting documents. At the end of the page mentions the name of the head of the organization, affixed his signature, date and stamp of the company. 1. In this article, a sample table for those situations where there are only members (shareholders) who are natural persons. In the case that at least one of the participants (shareholders) of the organization is a legal entity, you must disclose information about him, down to the ultimate beneficiaries who are natural persons.